I have written before about what to do during and after a race where everything seems to be going wrong. Unfortunately, bad runs aren’t limited to races. In the months you spend training for a marathon, you’re likely to have at least one bad training run. It’s a matter of when, not if. A bad run during marathon training, especially if it was a long run, can mess with your head. Long runs are the best test for how your training is proceeding. When a long run goes bad, it is hard not to get discouraged about your overall training or get bogged down in negative thoughts. While getting over a bad race is all about accepting it and moving on, bad training runs are about figuring out what happened, why it happened, and changing things up accordingly. If the thing that made your run bad is identifiable – this one is easy. If your shirt caused chafing, stop wearing that shirt for running. Problem with blisters? Try new socks, shoes, or methods of tying your shoelaces. This can take a little trial and error: For something like a blister, you know the result, but not always the cause. Try changing one thing at a time until you find the culprit. Different socks on one run, a new shoe-tying technique on another. Shorter runs during the week are a great time for these little tests. You’ll come across the right combination eventually. Sometimes the cause of a bad run is identifiable, but it isn’t something you can fix. Think: bad weather. Unseasonably hot or cold temperatures or high winds. Maybe it was raining cats and dogs. You can’t change the weather for a training run, but you also can’t change the weather on race day (and you need to expect the unexpected on race day). Use these bad training conditions to test your rain gear or practice carrying extra water for hot weather; or after-the-fact, recognize that you need to get new rain gear or need a way to carry extra water. With this practice, if you wake up on race day and find a deluge worthy of Noah, you’ll be ready. More often than not, dealing with a bad training run isn’t as simple as just switching out a shirt. In these cases, you may need to play detective to figure out what happened. Occasionally review this log. Are there any patterns that align with your bad runs? Maybe skipping lunch on Friday leads to you feeling off on a run. Or maybe you can find a pattern between how much (or little) you sleep and how you feel on a run. Was anything different on this run than on previous training runs? Do you have a big work project that is making you less mentally present in your run? Did you start doing track or strength workouts for the first time this week that has possibly taxed your body more than you expected? What to do depends on what has changed. There may be something you can fix, like a bad diet or lack of sleep. If you added in additional workouts, you may just need some time for your body to adapt (assuming you are tired, not possibly injured). While you adapt, you may just have to resign yourself to a few not great runs. A large part of marathon training and having successful long runs is mental training. Consider how you are thinking about your runs, both while preparing for them and while running. Note if there are patterns between your thinking and how your run goes. For example: I struggle most when I expect a run to be easy. This predictability happens when I am tapering for a marathon. I’ll spend all week excited about how great it is that I ‘only’ have to do 10 miles. ‘That’ll be so easy’ I think. Without fail, I feel terrible on those runs. While 10 miles may be easier than 20 miles, no long run is ever ‘only’ anything. 10 miles is still hard. It can be hard to change your thinking, but simply identifying the pattern can go a long way in improving your runs. Know that sometimes, regardless of how well-trained you are or how experienced you are, sometimes there is no rhyme or reason to bad runs. There is no cause that can be fixed. It doesn’t mean you are a bad runner that you are doing it wrong. Some days you’ll just have a bad run. Learn what you can, change what you can, and forget the rest. 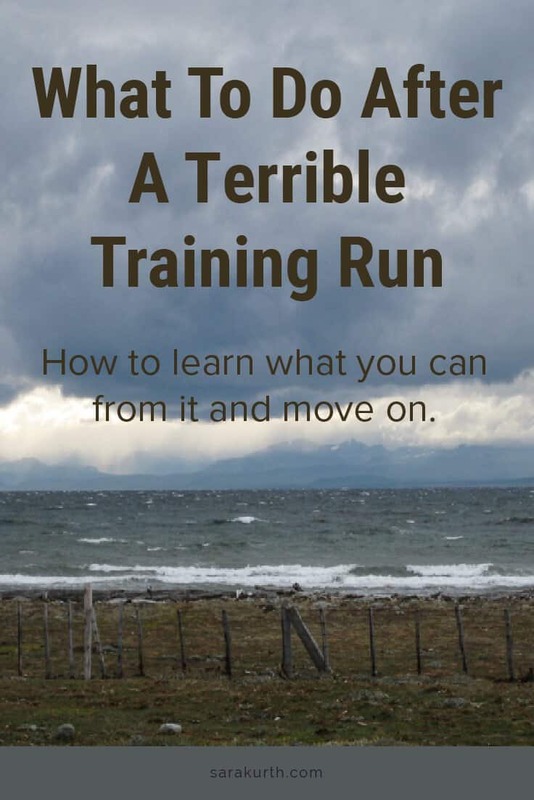 What have you done to get over terrible training runs?